In 21st century India, feminism is not a nice word. Multiculturalism is politically perfect and loaded with identitarianopportunism. Personal laws of communities like marriage, divorce, inheritance, adoption and death are controlled by religion. So multi-culture here meansmulti-religion's laws.Laws in India are a legacy of the colonial era. For the state, these hand-me-down personal laws are tools to grantminorities rights and boast of being a multi-cultural democracy.When minoritiesgain group rights, women lose out as women occupya subordinate status in most cultures and granting group rightensures the maintenance of their lower status. Feminist sociologist Tamanna Khosla points out that women are also a 'cultural minority' as their way of life is considered to be a 'minority' way in the public and political space, still male dominated. 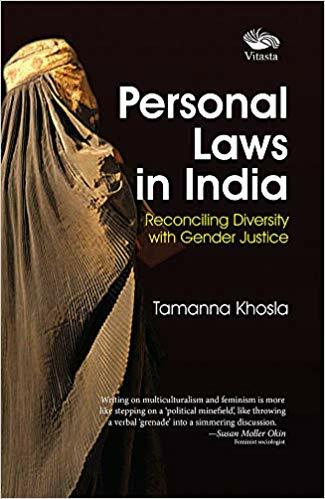 The book, Personal Laws in India: Reconciling Diversity with Gender Justice, placesthe personal laws and diverse issues that haunt women and children for the eightreligious groupingsin India under one umbrella reference.It analyses cultures of different communities and sees how equitable they are to women. Tamanna Khosla is a teacher of multiculturalism and feminism. Having done her Ph D from Jawaharlal Nehru University, she is at present Assistant Professor in Delhi College of Arts and Commerce in the department of political science. She has been teaching Delhi University courses at the master's level. She has also worked as research associate in research institutes such as JNU, WISCOMP and CSR and has contributed subject-specific articles to several newspapers and journals.